I’ve been wanting to read Oscar Wilde for some time, and though he’s mostly famous for his plays, I chose to start with his only novel, published in 1891. The premise of The Picture of Dorian Gray intrigued me, especially because its Victorian audience had deemed it immoral, criticizing its decadence and allusions. It didn’t take much to offend such an audience, mind you; the Victorian era was proper in every sense of the word—concerned with ranks and high morals, and above all else, appearances. This is a story about obsession, orchestrated by art, pleasures, and vanity. Wilde explores society’s obsession with beauty and eternal youth, exposing the ugliness that sprouts within when one is poisoned by ego and influence. A cautionary tale of sorts, it condemns those who over-think and inject meaning into things that just are—as Wilde was a big proponent of the aestheticism movement. The purpose of art is called to question and serves as the book’s main theme. The Picture of Dorian Gray is a Gothic, psychological thriller set in Victorian London. Sounds delightful, doesn’t it?! The grand aristocratic homes, the dimly lit streets peppered with horse carriages, the rain trickling down windows as dinners are enjoyed indoors… all these elements paint the novel’s setting, and Wilde is careful with his details, focusing on the psychological state of the main character, Dorian Gray. Although the action builds rather slowly, the third-person narrative (sometimes interrupted by the author speaking directly to us) drives the book with full force, culminating with a bold and powerful climax that I must admit, I didn’t see coming. The pages are filled with rich philosophical debates and witty dialogue, but the moral decline of Dorian Gray, who I only sometimes pitied, remains the central focus, with each exchange and internal monologue reflecting his impressionable character. The story begins with his being a “beautiful”, innocent, oblivious young man, untainted by cynicism. Indeed, ignorance is truly bliss for Dorian Gray in the beginning. Living life in carefree luxury (with way too much time on his hands! 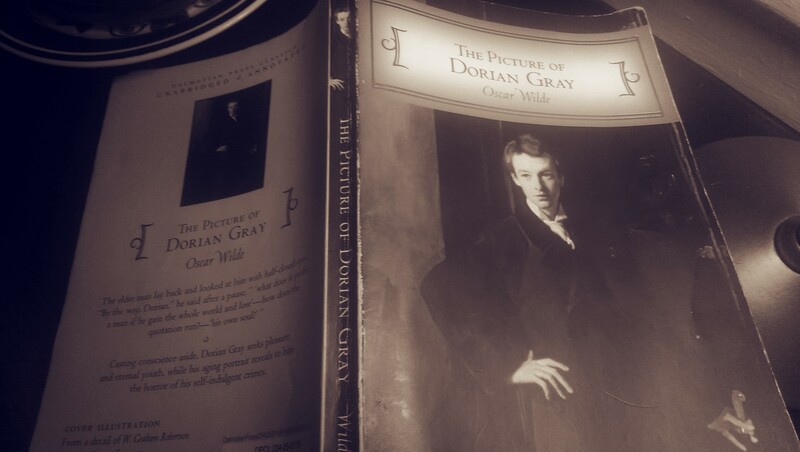 ), his growing ambitions, vanity, and curiosities gradually tumble him into “grayness” and misery, and I found it interesting that his name is always used in full throughout the book—rarely if ever is he referred to as simply Dorian, or Gray, perhaps to emphasize that his entire being is corrupt, not just his actions. There were times I did chuckle at the dramatic undertones, especially in relation to the way the characters spoke, but their word choices and phrases only emphasized the time and place of the novel, which I enjoyed thoroughly. And the ending to me was perfect… a true, natural conclusion very much in line with the ominous tone that carries the book, so that we’re finally left with a clear “picture” of Dorian Gray. So if you’re in the mood for a quick-read classic, pick up this book and indulge yourself. 😉 Or have you read it already? What did you think?